The Hwy. 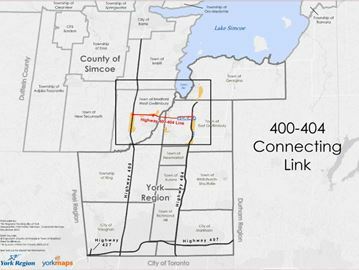 400/404 link has topped priority lists for municipalities such as Bradford, Innisfil and East Gwillimbury. Talks surrounding the proposed Hwy. 400/404 link, formerly known as the Bradford Bypass, seem to be gaining more ground as months go by. Mayors within Simcoe County and York Region continue to meet on a regular basis about the topic at hand, pushing the importance of the project to various ministries within the provincial government. Most recently, many of them – including Mayor Rob Keffer, Deputy Mayor James Leduc and councillors Raj Sandhu and Ron Orr – attended an Association of Municipalities Ontario conference, where the link was a hot topic of conversation. “The buzz is out there. People are wanting this link,” Leduc shared at an Aug. 23 council meeting. Bradford residents have been sharing their views on the link as well through social media – many expressing their strong support for it, as traffic congestion between Hwy. 404 into Bradford becomes greater every year. The committee of mayors in favour of the project have been pushing it as a future transportation corridor. As growth continues exponentially throughout not only Bradford but municipalities surrounding our area, the need for alleviation has been bumped up the priority list for many municipalities, including Newmarket, Georgina and Innisfil. But there is a way for everyone’s voices to be heard – whether you are a mayor, councillor or resident. Until Oct. 31, the provincial government will be accepting comments of support or concern regarding the link, which could potentially be included as a vital part of the Growth Plan for the Greater Golden Horseshoe. Keffer says each member of the committee will send in a comment from the standpoint of his or her municipality. The link is still on the radar of the Ministry of Transportation. A public relations campaign will be launched to show its importance, Keffer said.